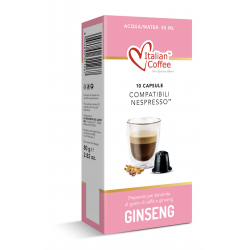 One box contains 10 Ginseng coffee capsules, compatible with OriginalLine Nespresso® machine. If you need the fuel to tackle the day, or just want a mid-day boost, then Ginseng coffee is your edge! This is a blend of: Coffee, ginseng powder, sugar and milk. Legal Note Italian Coffee® capsules come in a 10-capsules sealed box and are patented and certified to be compatible with all OriginalLine Nespresso® machines (Inissia, Lattissima, U, Pixie, Citiz, Essenza, Maestria, Kitchenaid®). Nespresso® is a registered trade mark by SOCIETÈ DES PRODUITS NESTLÈ S.A. Italian Coffee® is a registered trade mark by La Boutique del caffè SRL. Kitchenaid® is a registered trade mark by KitchenAid, U.S.A. There is no affiliation between Nespresso®, Kitchenaid® and their affiliates and IMPORT39 LLC and any of its affiliates.